As living space both indoors and out becomes an increasingly precious commodity, private and public areas are having to work harder. It was the late Dutch traffic engineer Hans Monderman who pioneered the 'woonerf' concept, where different types of users occupy the same street space. His vision has now become reality, with space usually devoted to vehicles being converted into multimodal walkable, bikeable, drivable zones for everyone to use and enjoy. Hard and soft materials, colour, patterns and lighting all have key roles to play in creating the subtle boundaries between zones that bring his vision to life. As well as doing the job that walls used to do, demarcation paving can also mark out paths of travel between the different areas. 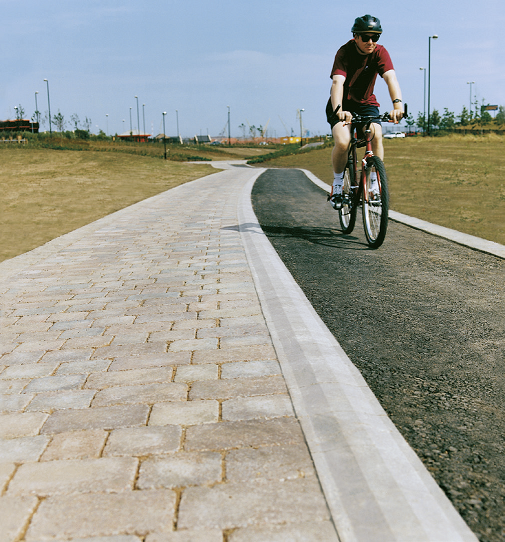 Marshalls’ Good Design Guide talks of the need for our shared spaces to be informed by the ‘Ease of Movement’ principle – in other words a design which allows every user to feel safe and comfortable, whether on foot, two wheels or four. This has never been more important than at a time when an increasing number of our roads and pavements are being turned into shared zones to be used by cars, bikes and pedestrians alike. Road surfaces in many towns and cities are now being raised level with kerbs, thereby eliminating the assignment of particular space to be used by pedestrians or vehicles. However, this doesn’t mean that cars are free to encroach on the shared spaces – effective demarcation provides clear visual cues for drivers to follow. The use of different coloured paving can provide a clear indication of the space in which drivers are required to stay. Adding a slight curve to the path, along with the placement of traffic calming measures and physical barriers such as planters or other landscape furniture, also assists in the visual separation between driver and pedestrian. Further, more subtle demarcation can be achieved by considering the texture of the paving being placed on shared spaces. Tactile paving is an essential part of any public area, serving as a warning to visually impaired pedestrians of road crossings or changes in gradient. It can be shaped to inform the safest direction of travel, as well as to point out any dips and turns in the path. Employed on train platform edges and kerbsides, it enables users to travel in safety while enjoying less stressful journeys. In conjunction with cycleway demarcation, cycleway tactile flag paving serves to mark out the areas that can be used by cyclists – and to warn visually impaired pedestrians. Where raised road levels still require a sense of delineation, tactile flag paving can assume the role of kerbside paving both in colour and design. It separates pedestrians from car lanes where there’s less of a ‘shared’ feel, in busier areas, and also provides warning underfoot for visually-impaired users of the area. The world of ‘woonerf’ envisaged by Hans Monderman may not yet be fully realised, but it’s certainly starting to take shape. While it may at first appear counter-intuitive, such an approach brings with it a number of distinct advantages. 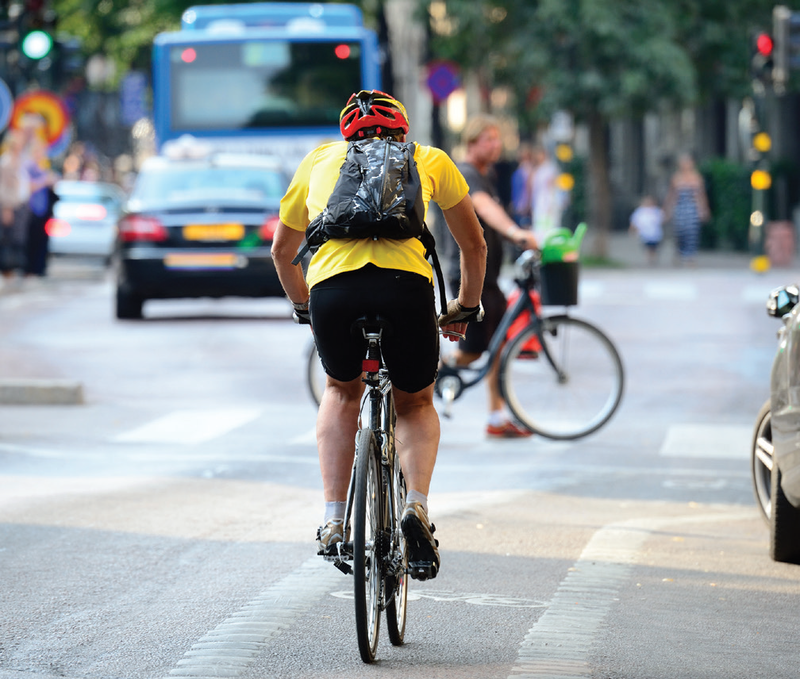 As a concept that encourages cycling and walking, it creates the promise of a reduction in carbon emissions and air pollution – a particularly pleasant perk for those whose local roads are choked by heavy traffic. In addition, urban neighbourhoods become more ‘liveable’ as locals increase their contact with each other on the streets. Dutch researchers have even found that the ‘woonerf’ concept has been successful in reducing the number of road accidents. As the benefits of multi-use spaces become more apparent around the world, it’s time for the UK to consider how best to make its streets work harder for the enjoyment of all who use it – and not just as a leg on their daily commute. Whatever the size and scale of your project, Marshalls can provide industry-leading solutions. Backed by more than 120 years’ experience in landscaping, we offer a full range of high-quality products to suit any scheme.